Thank you Foto-4-ALL for this thought provoking interview and beautiful layout. Winston Churchill, also quoted on Lisa’s Cueman website, once said that “there is something about the outside a horse that is good for the inside of the man.” And looking at her images, I can only agree. Simple images, forms that are explored, the joy of standing next to such great creatures… You will find it all in Lisa’s body of work. I was thrilled to spend some time being interviewed about my photography of the wild horses in the Outer Banks of North Carolina by this beautiful publication that encapsulates equestrian lifestyle. It was Easter Sunday afternoon and I was sitting on a beach in Florida with my husband and 1,000 other people enjoying the warmth and sunshine when I checked on my Facebook business page. I had several new “likes” and a few comments about a shot of mine they saw on National Geographic’s FB page. “Huh? What shot?” I thought to myself. I headed over to NG’s page and there it was, this image, featured on their facebook page with a few thousand “likes” and a couple of hundred comments. It had only been posted for about one hour. 24 hours later, there had been 21,000+ likes, 4,000+ shares and 1000+ comments, a huge spike in visits to my web site and a big increase in followers on my FB page. I was just blown away! So how did it all happen? Since I have been asked this question a number of times, I thought I would blog about it as well. A friend of mine and an outstanding photographer/journalist, Robyn Gianni, had one of her images featured on NG’s Photo of the Day. She told me about their submission process so I decided to give it a go. I set up an account for the “My Shot” submissions in January and began submitting one image a month, the main requirement. 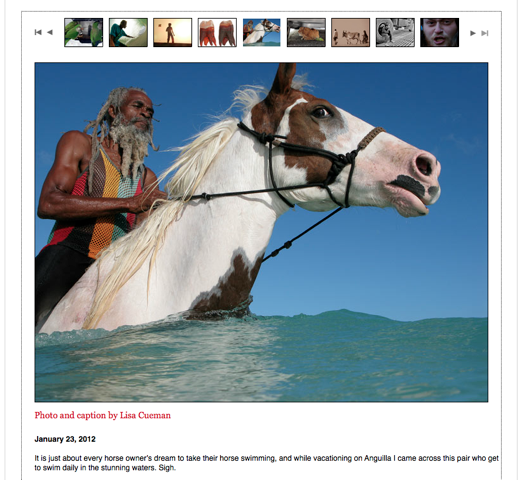 My first image, seen below, was selected later that month as a pick for the Daily Dozen. In March, I submitted “Be Still” and it too was selected for the Daily Dozen feature which, in both cases, has been a big thrill. On April 8th, someone working at National Geographic decided to post “Be Still” on their FB page. When you think about how many images they must see in a day, I feel incredibly honored to have had them showcase not only one, but two images. I have also had the pleasure of conversing with people from all over the world because of this exposure and I cannot thank National Geographic enough! I am thrilled to be a part of a two-person show that opens at The Iris Gallery of Fine Art Photography on Newbury Street in Boston, MA on April 10th. I will be sharing the gallery space with the gorgeous photography of George Shattuck. George’s reductive landscapes truly capture the stunning beauty and color of the oceans and lands that resonate so deeply with him. Next to horses, the ocean holds a special place in my heart and it seems fitting and an honor that my work will be shown alongside George’s. To treat your eyes on more of his work, visit his website. 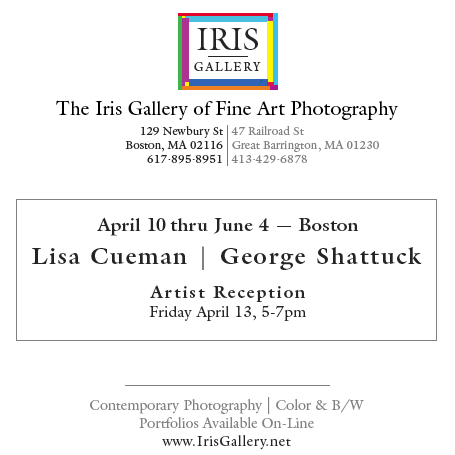 The Iris Gallery is located between Clarendon and Dartmouth Street in Boston. Known for their collection of contemporary works in both black & white and color by well established and emerging artists, the Iris Gallery has an impressive group of acclaimed photographers and I am incredibly grateful not only for their representation but also for this opportunity to exhibit . The show runs until June 4th with the Artist reception being on April 13th. I will have fourteen pieces hanging, ranging in sizes from 16 x 20″ up to 36 x 54,” presented in both the traditional mat and frame style and a floating plexi style which is a contemporary, frame-less presentation. Both George and I will be present at the gallery on the 13th and hope to see you there. It’s showtime here in southern Vermont as the area plays host to the 6-week Vermont Summer Festival Horse Show in East Dorset. The rings have been groomed, greenery installed, mobile offices in place and twelve, gigantic, blue and white tents that offer cover to the temporary stalls have been erected. Horse vans big and small have arrived to unload their precious cargo into the stalls to partake in the first week culminating today with the first Grand Prix of the six-week show. It is a great horse show and has come a long way since its early start as a two week show some 20+ years ago. Even with all its growth, it still maintains a relaxed feel and with so much to do outside of the showgrounds, the event offers families an opportunity to enjoy a little R&R during the non-show days of Monday and Tuesday. I always look forward to its arrival and the myriad of photographic opportunities it offers and if you are in the area, be sure to stop by with Sundays being Grand Prix day, scheduled for a 1:00pm start.